With our recent launch, we opened up some of our APIs for creating Internet TV channels and experiences. Our belief all along has been that we are in the early innings of Internet TV, and that we would soon begin to see broad innovation in how consumers interact with and experience TV content on the Web. To that end, we've developed a suite of APIs that enable any website and web developer to integrate TV and video into their sites in unique ways. The first wave of Web video has focused on either single video titles embedded in web pages or aggregated channel experiences presented in rich media players created in Flash. These are both "out of the box" templates in our model. But the really interesting stuff comes when a publisher can both express their brand in really unique and compelling ways, and offer new forms of interactivity, communication and engagement with the programming. Most traditional video programmers have been trained to think about their product as providing short or long linear experiences. But the Web has taught us that consumers love to engage, lean-in and interact. We're also in the early stages of marketing and advertising with video on the Internet, and there are wide open possibilities for synchronizing and integrating marketing and advertising in and around video content. Yesterday, one of our publishers launched a new video experience on Brightcove that taps some of the power of our APIs to create a music video channel that integrates product placement and e-commerce. There's long been talk about product placement as a way to address the shifting behavior of consumers who can zap and skip commercials. When combined with the interactivity and e-commerce services of the Web, it starts to get more interesting. Here, StarStyle takes music entertainment and ties it to merchandising for the products of the stars. You can imagine where this will take us over time. This is obviously just one of the many early experiments that we expect to see. One of the cool features with our APIs is support for something that we call Cue Points. 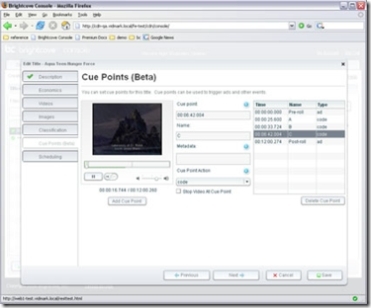 Cue Points essentially allow a publisher to define breaks or events in the timeline of a video. Using these Cue Points, a web developer can do any number of things, including synchronizing content or interactions with a specific time in a video, such as related content, or a call to action like voting, product placements, etc. Flash developers can use these to overlay content and advertising on and around the video. These Cue Points can also be used to create 'Chapters' in longer content, making it easy for a consumer to navigate through longer content, much like DVD chapters. We're also using these as a way for a publisher to define logical Ad Breaks in a longer title, and we're experimenting with new ad formats that are sync'd to those ad breaks (not just video commercial breaks, but some more clever things that are less intrusive for the consumer). There's a brief tutorial on using Cue Points on our developer community site. Now that our service is available and free, we're excited to see what the global web development community can do to improve the experience of television on the Internet.